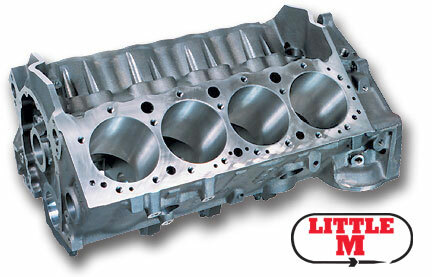 The Sportsman block shares most of the Little M's best features, but saves you money by using ductile iron main bearing caps (4 bolt on the center three and 2 bolt on the ends), and employing a rear external oil feed, crossover and restrictor provision. Extra thick cylinder walls resist cracking and improve ring seal for more power. Priority main oiling system directs oil to the main bearings first for more dependable lubrication. Blind tapped head bolt holes prevent water leaks. Standard small block deck height allows use of off the shelf parts. Open lifter valley improves return to oil pan. Enlarged lifter bosses accommodate offset and oversize lifters. Nodular iron main bearing caps. Utilizes standard pan, oil pump and two piece seal. Rear external oil feed, crossover and restrictor provision. Cam bearings, freeze plugs and dowels are not included. Available in 350 or 400 mains, 4.00 or 4.125 bore.